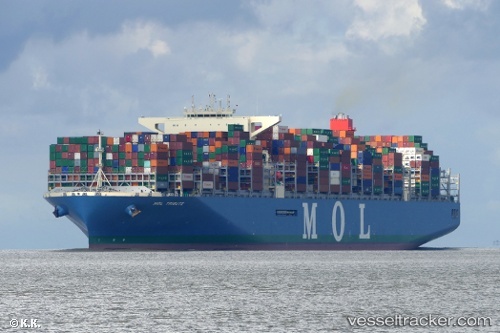 The Ocean Network Express’s ultra-large containership MOL Tribute has set a new record for the most twenty-foot equivalent containers ever loaded onto a vessel with 19,100 TEU. The record-setting stow took place at the PSA Singapore terminal on February 11, 2019. The "Mol Tribute" had to carry out an emergency anchoring manoever while berthing in the port of Hamburg. The ship, cmoing from Southampton, was mooring with tug assistance on Sep 1, 2017, during its maiden voyage. To acoid the allision with other ships in the Waltershof Port, the anchor had to be dropped before reaching the berth at the Burchard Quay. The ship could be stopped in time and safely berthed at 1.30 p.m. By Sep 4 it was still in port.